Fraternity in Iraq needs your support to build a home for Qaraqosh’s disabled children! In Qaraqosh, Fraternity in Iraq supports the development of a care center for disabled children. Sponsored by Sister Amira, a long-standing friend, this ambitious project will eventually be able to accommodate around 50 children. 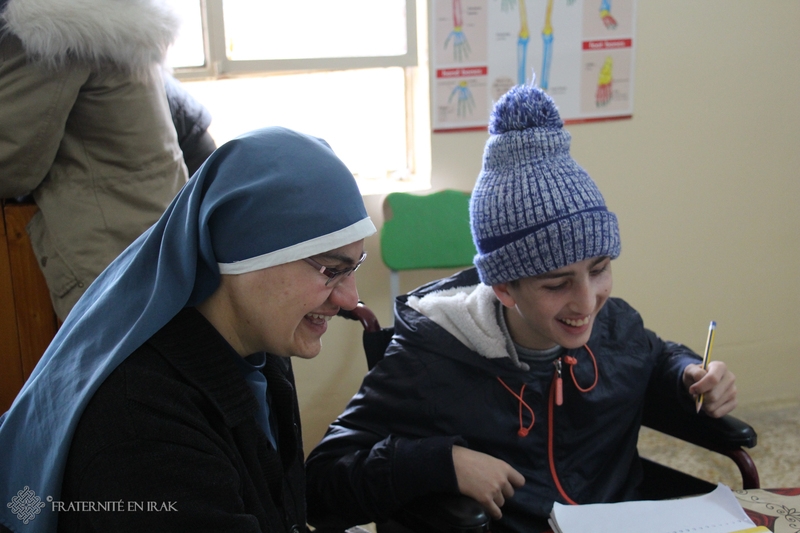 One year and a half after ISIS’ defeat, as Qaraqosh is gradually being rebuilt, Sister Amira, an Iraqi nun who founded a new community a few years ago, is busy taking care of disabled children. She requested help from Fraternity in Iraq in order to build a care center that will make it easier to accommodate the children. Diana (left) and a friend from the center are focusing on their work! Parents are indeed at a loss when it comes to dealing with their disabled children, as they already struggle with large families and a culture that negatively perceives disability, which often results in disabled children being left unattended! Sister Amira couldn’t accept this situation and she has been dedicating herself for several years to providing these children with special care and more comfortable everyday lives. 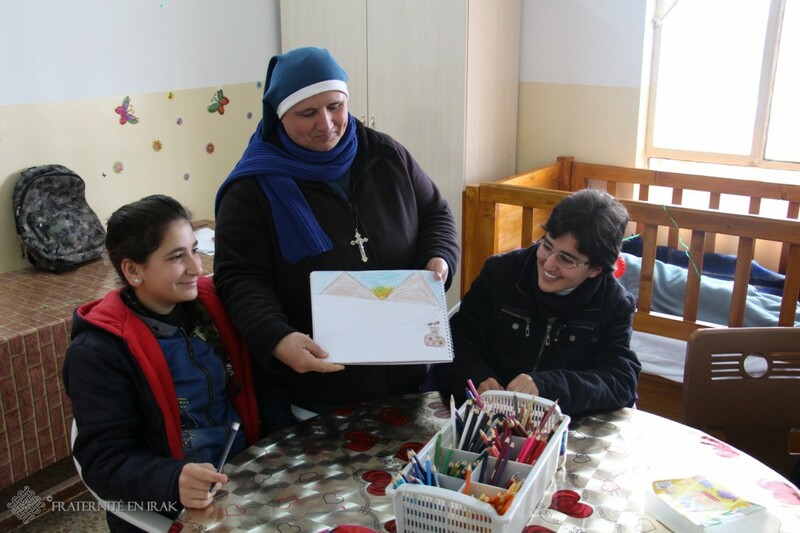 Prior to 2014 and ISIS’ onslaught on the region, Sister Amira and 3 other nuns from her community had also underwent training to take care of these children in a professional way. A dozen children are welcomed every day in the apartment that is currently being used as a daycare center. 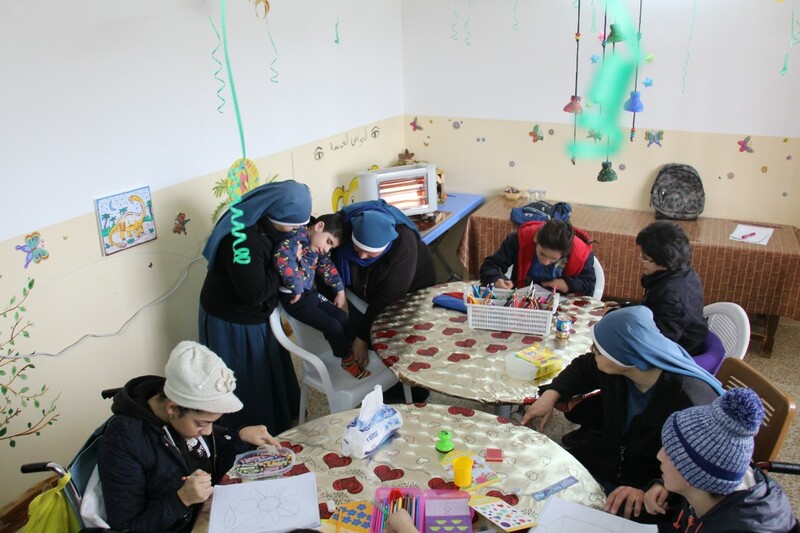 Yet their 4-rooms apartment is becoming too small, while the nuns are getting more and more requests from families located in Qaraqosh and in neighboring villages. By building a new care center, they plan to be able to accommodate more than 50 children, aged 3-16. This house would include an oratory, several dining rooms (which would lessen the overall noise level, as noise is particularly exhausting for these children), a kitchen, a gym and dormitories. Sister Amira plans to accommodate full time around 20 children whose families are too poor to house them or to take care of them. This new establishment is designed to offer a calm and peaceful environment. An elevator would link the two floors and all the rooms will be entirely adapted to the needs of the children. Sister Amira (center) and a novice (right) admire Diana’s work! This center will hire around 15 employees: 1 trained educator for each 5 children, a psycho-motor therapist, and a cook, not to forget guards who will be in charge of security, night and day. Construction works are ready to start: a piece of land has been selected and the workers, Christians from Qaraqosh, are eager to begin the groundwork! The overall cost is estimated at €270,000 (approximately $306,000). In order for us to gather this amount, we do need your generosity! Help us fund this care center to offer dignified living standards to disabled children in the Ninewa Plain!